Just a quick reminder that, this coming Saturday (March 29th) virtually the whole Regeneration One team will be at Orbital Comics in London with our signing pens (and body armour) at the ready. Myself, Andrew Wildman, Geoff Senior, Stephen Baskerville, John-Paul Bove and Jason Cardy are ready and waiting for copies of issue #100 to be thrust under our noses for the barely legible scrawls that we call our signatures. For more details, click on the link here. Yep, it’s true, I’m not yet tired of flapping my gums and shouting from the rooftops about Transformers Regeneration One #100, which hits stores today — Wednesday 19th March. And so, over on ComicsVerse, there I am, blathering away again. If you can stand yet more opining from yours truly, you can find the interview here. It’s the end of an era. 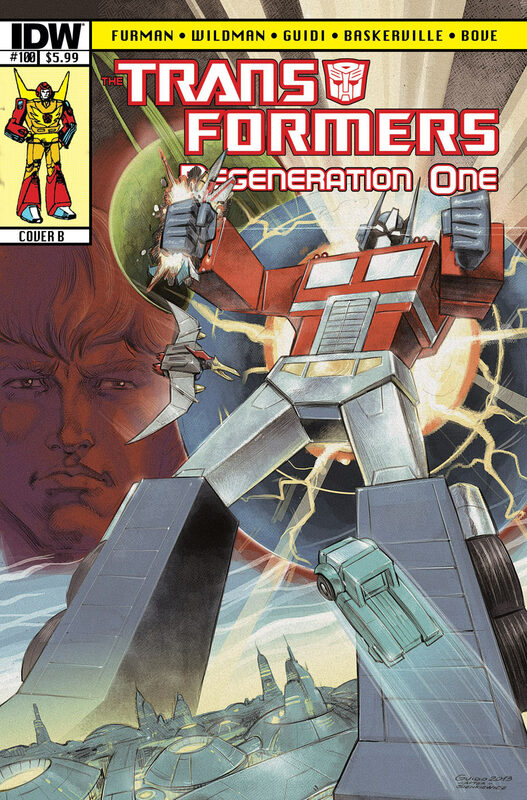 After 30 years and 100 (or so) somewhat interrupted issues, the founding/grounding Transformers saga reaches its epic conclusion. RG1 #100 (#100 in a four-issue limited series!) hits the stands this Wednesday (March 19th), and one way or another it is, definitively, the end. Storylines years in the making are wrapped up as the full extent of the threat to Cybertron (or is that Cybertrons?) is revealed. Of course, I’m not going to spoil anything here. Just to say that this is a conclusion not just to Regeneration One, but to the whole 100 (or so) issue saga. Seeds of this were sown waaay back, and while the substance of the overall threat has become more all-encompassing in the intervening years (between when the original series finished back in 1991 and RG1 starting up), the basic premise is what I was always pushing towards. Hopefully, it all ties together pretty nicely. But I’ll leave that for you, the reader, to judge. What I can reveal is that as well as three titanic Transformers artists (Andrew Wildman, Geoff Senior and Guido Guidi) combining their talents for #100, there’s a host of bonus material, including afterwords, bonus art, and a special prose story that deals with another layer of the conclusion we simply didn’t have room for in the main story (and come with a nifty illustration by JP). It’s a no ads, cover to cover, giant-sized fest of RG1 goodness. Don’t miss it. BTW, if you’re in or around London on March 29th, come to Orbital Comics and get your copy signed by (virtually) the whole team — myself, Andrew, Geoff, JP, Stephen and Jason. A preview of the issue can be viewed here. Just a quick note that due largely to logistical issues, I won’t be appearing that the East Midlands Comic Convention (on March 16th) as previously trailered. Apologies for anyone who was hoping to to catch up with me there. So next up will be the previously reported Orbital signing on the 29th, and keep watching for further ‘con announcements. Several biggies TBA. Yep, as the milestone that is Transformers: Regeneration One #100 nears, so the interviews keep flying in. This latest one can be found over on Bleeding Cool – here. You are currently browsing the simon furman blog archives for March, 2014.